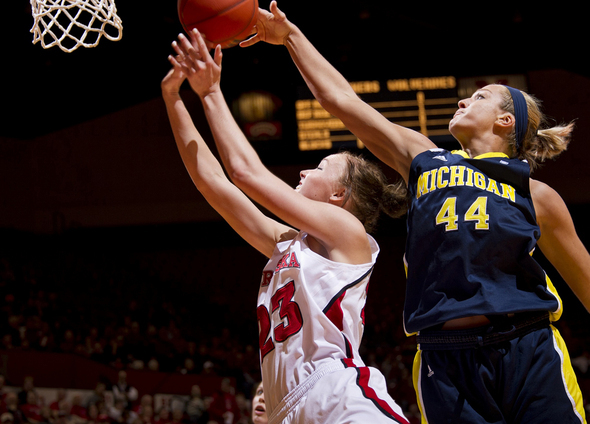 Posted on Thu, Feb 9, 2012 : 10:16 p.m.
Michigan's Rachel Sheffer (44) blocks a first-half shot by Nebraska forward Emily Cady during the Wolverines' 63-52 win Thursday in Lincoln, Neb. They were calling this “Wolverine Week” in Lincoln, Neb. The Michigan women’s basketball team gave that tagline a whole new meaning when it completed a Wolverines sweep by upsetting No. 13-ranked Nebraska, 63-52, Thursday night at the Bob Devaney Sports Center. As part of a special promotion, fans with tickets to Michigan’s 62-46 men’s basketball win at Nebraska on Wednesday night could watch the Thursday night women’s basketball game for free. 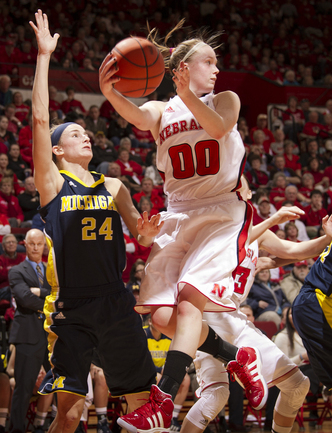 Nebraska guard Lindsey Moore (00) gets trapped under the basket by Michigan guard Jenny Ryan. The Wolverines didn't allow Nebraska to score its 20th point until there was 12:09 left in the game. The 7,642 that took advantage watched their Cornhuskers go more than 14 minutes of the first half without a basket while Michigan took a commanding 32-12 halftime lead. "If you told me we'd hold them under 20 points at halftime I would say you're nuts, not a chance," Michigan coach Kevin Borseth said. "I had every imaginable, concocted defense figured out to stop them, because I didn't think we'd be able to stop them." The Wolverines extended that advantage to as many as 27 points (41-14) in the second half before Nebraska starting chipping away. A 12-0 Cornhusker run late in the second half pulled them within 58-50 with 2:02 left to play, but Michigan iced the win by going 5-for-6 from the free-throw line over the final 1:33. "I knew they would come back," said Michigan senior guard Carmen Reynolds, who matched her career-high with 16 points on 6-for-10 shooting, which included an efficient 4-for-5 from 3-point range. "A team like that, they'll never give up. We were able to hold them until the end." Senior guard Courtney Boylan (14 points), junior forward Rachel Sheffer (13) and junior guard Nya Jordan (11) joined Reynolds in double-figure scoring total. Jordan added a team-best 10 rebounds and four assists for the Wolverines (18-7, 7-5 Big Ten). Junior guard Lindsey Moore scored 18 of her game-high 23 points in the second half for Nebraska (19-4, 8-3), which missed out on a chance to climb into a first-place tie with idle Purdue in the Big Ten standings. It was fitting that one ticket got fans into both Michigan vs. Nebraska games, since they played out similarly - with strong defensive performances by the Wolverines. In the men’s game on Wednesday, Nebraska didn’t score its 20th point until 12:22 left in the second half. One night later, the Nebraska women crossed the 20-point mark with 12:09 remaining. According to STATS LLC, Nebraska's 12 first-half points were the fewest by a Top 25 team against an unranked opponent since then-No. 9 California scored 11 against Oregon State in February 2008. The Cornhuskers made 4 of 30 shots in the first half, including 1 of 15 on 3-pointers. "The first half, we couldn't buy a shot," Nebraska coach Connie Yori said. "Shooting has a tendency to be contagious. When shots go in, it makes the next shot a little easier. When you go 0 for eternity, it makes each shot a little more challenging." The Wolverines finished 22 of 46 (47.8) shooting from the floor, 8 of 16 (50.0) from 3-point range and 11 of 13 (84.6) from the free-throw line. Nebraska, which had won four straight games, finished the night 17 of 66 (25.8) shooting, 9-for-37 (24.3) from 3-point range and 9-for-15 (60.0) from the foul line. The win was Michigan’s first against Nebraska, which held a 6-0 all-time lead in the series. It also strengthens the Wolverines' resume for an NCAA at-large bid if they don't win the conference tournament. "We've been bumped out the last couple years because we didn't have enough wins or wins at the end of the year," Borseth said. "It's important. We've really worked hard to put ourselves in position to do that. We're nowhere near done yet, but at least we're on the right path." Sat, Feb 11, 2012 : 12:07 a.m. Finally Boreseth has them ready to win a game they should win. Congrats. I am curious about next years recruits. Ann Arbor dot com gives little on womens recruits. Fri, Feb 10, 2012 : 3:47 p.m.
Congratulations! That was a great win. Keep it up.